THIS MONTHS CHALLENGE IS THE POTATO! ANY KIND< SWEET< RED< BLUE< FINGERLING< ANY!!!!! Wild potato species occur throughout the Americas, from the United States to Uruguay.Today over 99% of all cultivated potatoes worldwide are descendants of a subspecies indigenous to south-central Chile. 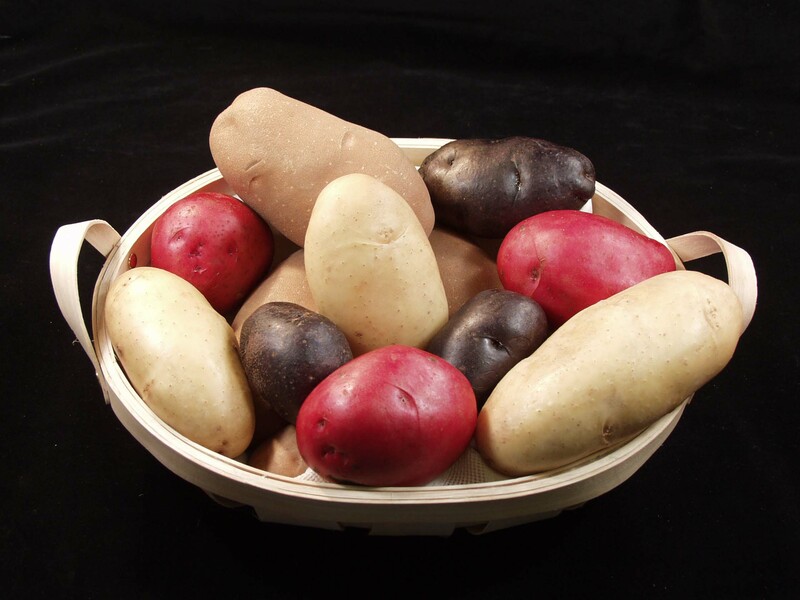 Genetic testing of a wide variety of potatoes suggests that all potatoes have a single origin in the area of southern Peru (from a species in the Solanum brevicaule complex), where potatoes were first domesticated between 3000 BC and 2000 BC. Introduced to Europe by Spain in 1536, the potato was subsequently conveyed by European mariners to territories and ports throughout the world. Thousands of varieties persist in the Andes, where over 100 cultivars might be found in a single valley, and a dozen or more might be maintained by a single agricultural household. Once established in Europe, the potato soon became an important food staple and field crop. The annual diet of an average global citizen in the first decade of the twenty-first century included about 33 kg (73 lb) of potato. However, the local importance of potato is extremely variable and rapidly changing. It remains an essential crop in Europe (especially eastern and central Europe), where per capita production is still the highest in the world, but the most rapid expansion over the past few decades has occurred in southern and eastern Asia. China is now the world’s largest potato-producing country, and nearly a third of the world’s potatoes are harvested in China and India.